There are just too many ‘red flags’ to be able to recommend playing with Unity Lotto. From the ‘hard sell’ telesales phone calls to the real cost of playing EuroMillions with them. Read the rest of our review below for more. First up, let’s be really clear here – ‘Unity Lotto’ is NOT ‘Unity Lottery’. They are not related in any way. Unity Lotto is a lottery syndicate company offering group plays in EuroMillions. Unity Lottery is a UK based society lottery that charities use to raise funds for their causes. Please don’t confuse the two! 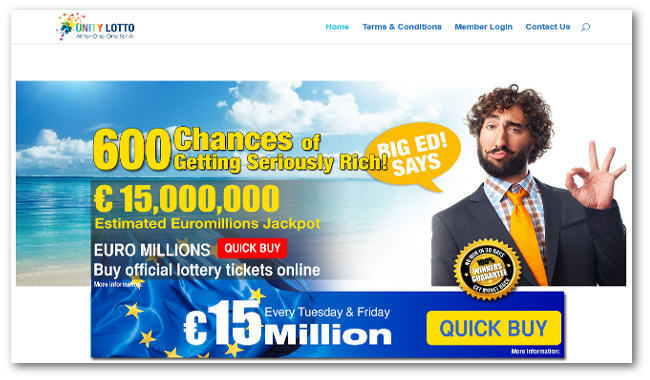 You can play EuroMillions with Unity Lotto. Although they may offer some other games too. I’ll explain why it’s not at all clear what else they may offer in a moment. NOTE: As their terms and conditions state, tickets are NOT bought in the UK. You do NOT therefore get any entry into Millionaire Maker draws or any other UK specific add-ons or promotions. Why Can’t I Join Online? Here’s the odd thing about Unity Lotto – they are heavily telesales based. That already sets our scam alert sensors tingling. They seem to buy in lists of people and call them at home to try and sell them a syndicate subscription. You can’t join online because they have no facility to join online. Which is why it’s not clear what syndicate options they offer. Their website hints that US Mega Millions syndicates may also be available, but no information is provided for any products because all memberships start with a telesales phone call. Our other concern here is that the telesales tactics used seem to be fairly ‘hard sell’ (you can find a number of complaints online). One of the issues is that they apparently promise you a refund if you don’t win in 3 months of playing – which is fine. Except that people have been left with the idea that they will get all their money back if they don’t make a profit. That’s not the case. If your syndicate wins the smallest prize just once, you no longer qualify for a refund. Because you have won something. Playing 75 lines a draw for 3 months your syndicate is going to win at least a Tier 13 prize (i.e. £2.70) – maybe more. But don’t forget that is split between 150 people. Your group would have to win at least £16,650 to break even. There is an online members area where you can check how your group is performing. But further to above, it’s also been pointed out that the winnings shown are actually for the entire group. One member stated they felt misled because they thought this was how much they had personally won. Because nothing said otherwise. They didn’t realise that their own winnings were these figures divided by 150. We feel this is misleading and should be corrected. It should either be made very clear right next to these figures that they are for the entire group and should be divided by 150. Or an additional column should be added to show the members own share of this amount. You CAN cancel without penalty in the first 14 days. That’s the good bit. After 14 days are up, you are locked in for 3 months at a time. And must give 30 days notice if you want to stop – otherwise you are locked in for another 3 months. We’re not sure why a 3 month cycle is necessary when payments are made monthly. Are They UK Or Not? There is very little information about who Unity Lotto are on their website. A phone number is provided, which appears to be London based. A map suggests they are in the UK. Their Terms & Conditions require players to be based in the UK. Yet they don’t buy tickets in the UK. And no company address is given, nor any official company name or registration number. That’s a concern. Especially when the company appears to actually be based in South Africa. Which is also where the telesales calls originate from. The bottom line is there are just too many concerns about Unity Lotto, when there are far better established options available like Play Lottery available. Or far better value for money options like You Play We Play available. We recommend politely saying ‘no thanks’ and hanging up on this syndicate.